We had so much fun last Thursday. 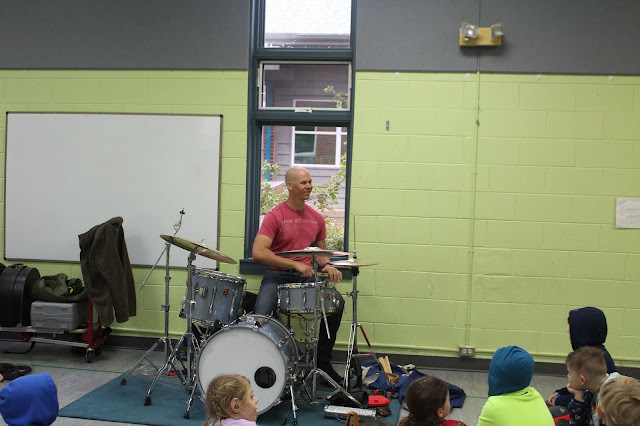 In the morning, Soupbones (Bradley's nickname) taught us lots about drums and rhythm. Bradley, formerly in the famous Blue Man Group, had us up and moving to his expert drumming. He explained how a metronome works and how polyrhythms mean many rhythms. A drummer takes lots of rhythms and puts them together. We learned about the whole drum set and the origin of drums - Africa. How do we play drums? Various drumsticks and even hands work. We learned that bigger drum heads make lower sounds, that a drum key can change the tightness of a drum head to make a different sound, and so much more. Jim Henderson, saxophonist, and former CFS teacher visited our dance class to not only teach us about his family of saxophones but to play for us and to read some poetry by Langston Hughes. Jim introduced River students to his 3 saxophones: soprano, alto, and tenor. 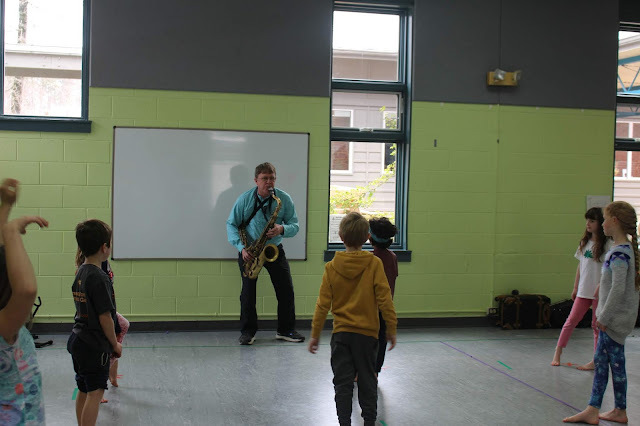 Jim played the saxophones while children moved their own way on their assigned X. Jim then plays and the children are still, listening to the music. Once the music stops, they move to what they have just heard. The group of students was divided into two. One group danced when the tenor sax was played and the other when the alto sax was played. Jim, at one point, plays both saxophones at the same time. He was inspired by a saxophonist called Rahsaan Roland Kirk who could play 3 saxophones at once - pretty impressive! Jim performed three songs from the time of the Harlem Renaissance: Chant in the Night, Harlem Nocturne, and Take the A-Train. He performs each one on a different saxophone. It was the students' turn. They picked two words - simplicity and hippopotamus - and Jim performs them with his instrument. We ended the lesson with three poems by Langston Hughes: What Happens to a Dream Deferred, The Dreamkeeper, and Dream Variation. Annie dances to one as Jim reads and the River students dance to the final poem, using their bodies to dance their dreams.